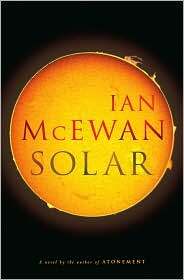 I am not going to say I didn't like Ian McEwan's latest novel Solar. I am just going to say I could not appreciate it. A “darkly satirical” novel, Solar follows physicist Michael Beard as he attempts to solidify his scientific reputation amid the upheaval and discord surrounding climate change. Unfortunately, his personal life is a perpetual mess and it doesn't change course just because of Beard's professional issues. Most of Solar's problems stem from this setup. Beard is a serial philanderer, a glutton, and an elitist snob. In short, he isn't meant to be likeable. His lack of appeal is intentional, but why? I'm sure there are valid reasons; it's just that, in my mind, none of them are valid enough to merit 285 pages of an unpleasant protagonist. Solar also includes far too many theorems and formulas the average reader has never heard of. It's evident the science and controversy of climate change caught McEwan's attention, but his insights into physics and mathematics just aren't the stuff gripping novels are made of. At times, reading Solar is like talking to someone who wants you to know he just learned something new. I'm hesitant to say Solar is outright bad. McEwan is a superb writer ? some of the clauses in his sentences are like corkscrew twists on a roller coaster ? and is a keen observer of human emotion and motive. His mockery is sophisticated and incisive. But with Solar he's put these talents to an end result that comes off like what it is ? a cold, precise exercise in something not very easy to embrace.